Thomas Jones Barker (1815-1882), Painter of portraits and military subjects. Artist associated with 6 portraits, Sitter in 1 portrait. Sir Archibald Alison, 2nd Bt (1826-1907), General. Sitter in 2 portraits. Colonel Alison. Sitter in 1 portrait. Captain Allgood. Sitter in 1 portrait. Major Hon. A.H. Anson. Sitter in 1 portrait. Sir David Baird, 3rd Bt (1832-1913), Army officer and landowner. Sitter in 5 portraits. Colonel Crawford. Sitter in 1 portrait. Captain Forster. Sitter in 1 portrait. Sir James Hope Grant (1808-1875), General; brother of Sir Francis Grant. Sitter in 7 portraits. William Wilberforce Harris Greathed (1826-1878), Major-General. Sitter in 2 portraits. Lieutenant Harwood. Sitter in 1 portrait. Sir Henry Havelock, Bt (1795-1857), General. Sitter associated with 6 portraits. Hon. Adrian Hope (1821-1858), Soldier. Sitter in 1 portrait. John James Hope-Johnstone (1842-1912), Lieutenant and politician. Sitter in 1 portrait. Sir John Eardley Wilmot Inglis (1814-1862), Major-General. Sitter in 3 portraits. Thomas Henry Kavanagh (1822-1882), Assistant Commissioner at Oudh; awarded civilian VC for his services during The Relief of Lucknow. Sitter in 1 portrait. Colonel Little (active 1857). Sitter in 1 portrait. James Metcalfe (1817-1888), Lieutenant-Colonel. Sitter in 1 portrait. William Robert Moorsom (1834-1858), Aide-de-camp to Sir Henry Havelock. Sitter in 1 portrait. Robert Cornelis Napier, 1st Baron Napier of Magdala (1810-1890), Field Marshal. Sitter in 27 portraits. Sir Henry Wylie Norman (1826-1904), Field Marshal and colonial governor. Sitter in 11 portraits. Sir James Outram, 1st Bt (1803-1863), Lieutenant-General. Sitter in 10 portraits. Sir William Peel (1824-1858), Naval captain. Sitter in 2 portraits. Major Probyn. Sitter in 1 portrait. Frederick Sleigh Roberts, 1st Earl Roberts (1832-1914), Field Marshal. Sitter in 81 portraits. Brigadier General Russell (active 1859). Sitter in 1 portrait. William Rose Mansfield, 1st Baron Sandhurst (1819-1876), General. Sitter in 5 portraits. Patrick Stewart (1832-1865), Soldier. Sitter in 2 portraits. Captain Watson (active 1857). Sitter in 1 portrait. 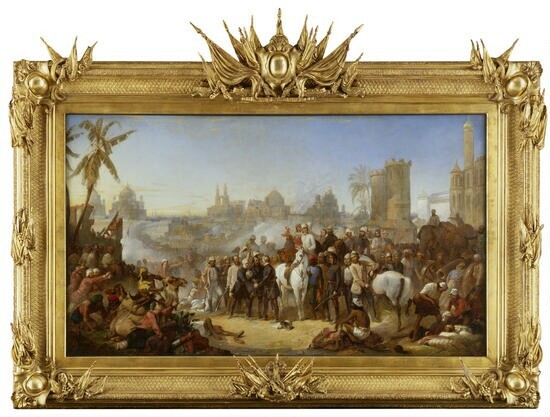 This painting represents one of the key events of the Indian Rebellion or Mutiny of 1857. 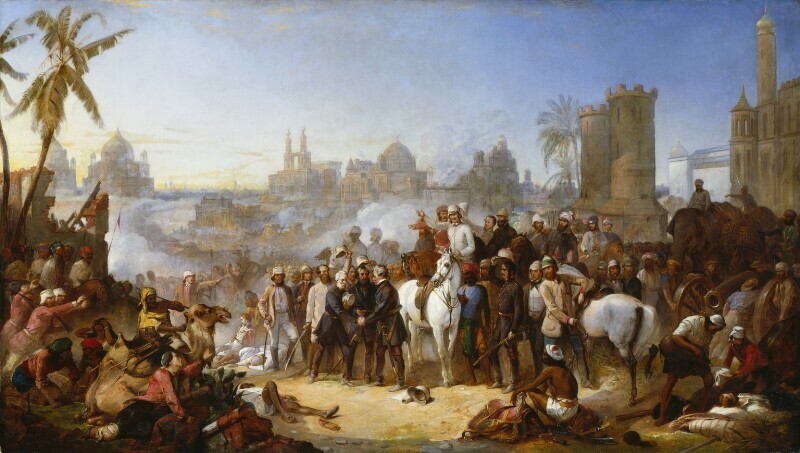 The siege of Lucknow, which had lasted from July, was raised by Sir Colin Campbell, the new commander of the British armies, on 17 November. Sir James Outram and Sir Henry Havelock, who died only a week later, had brought reinforcements to bolster the small number of troops initially under siege. British public opinion was profoundly shocked by the scale of the mutiny and by the loss of life on both sides; the massacre of captured Europeans, and the indiscriminate killing of Indian soldiers and civilians by the British armies. Formation of the first Liberal cabinet, following the dissolution of Parliament in light of the Liberal and opposition member Lord Russell's introduction of a resolution arguing for widening the franchise, carried because the Conservatives, the ruling party, only have a minority. Palmerston holds a meeting of Whigs, Peelites and Radicals, from which the Liberal Party is formed, and the Queen later invites him to become Prime Minister. Charles Darwin's The Origin of the Species is published, in which he sets out his theory of evolution based on the process of natural selection, species mutation, and survival of the fittest. The engineer Joseph Bazalgette begins work on constructing the London sewerage system, following the 'Big Stink' of the preceding summer. Bazalgette's system, now extended, continues to serve London. Outbreak of war between an alliance of France and Italian nationalists, and Austria. Napoleon III signs an armistice with Austria. However, pressure from Britain, supporting Italian unification to counterweight French and Austrian influence, leads to success for Italian nationalists. The first oil well is drilled in America, after Edwin Drake's discovery in Titusville, Pennsylvania, transforming a quiet farming region into Oil Creek.